An astounding 90,000 children in 1,000 schools across the UK and overseas have already signed up to Scottish Book Trust’s ‘Meet Our Authors’ programme. Scottish Book Trust, Scotland’s leading agency for the promotion of literature, reading and writing, created the programme to allow children, young people, parents and teachers across the world to get up close and personal with some of the world’s leading children’s authors, free of charge, with support from the Scottish Arts Council’s National Lottery Fund. The series of live events is the centrepiece of the programme and will feature household names such as Michael Rosen (March 4th), Julia Donaldson (May 6th), Eoin Colfer (October 7th), Philip Pullman (December 9th) and Jacqueline Wilson (January 27th, 2011) who will talk to a live audience whilst being filmed and broadcast simultaneously over the internet. The first live broadcast will take place on World Book Day, Thursday 4th March, with former Children’s Laureate Michael Rosen who will be doing two events - one for primary schools and one for secondary schools. 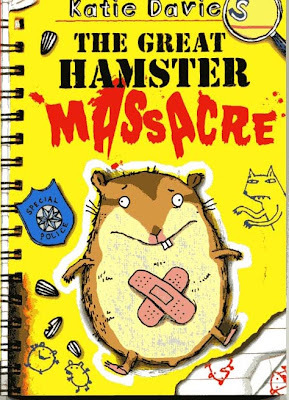 Début author Katie Davies­ has been announced as the winner of the Waterstone’s Children’s Book Prize for her book, The Great Hamster Massacre (Simon & Schuster). The book won over nine other titles, with Waterstone's describing it as the "closest competition" in the prize's six-year history.The title was revealed as the winner of the prize by Children’s Laureate Anthony Browne in an evening ceremony at Waterstone’s Piccadilly. Browne described the book as "a funny and touching story told very convincingly and honestly from the point of view of a young girl". Many congratulations...it is a really enjoyable children's book with splendid illustrations. Chris Meade, Director of if:book, with students and staff from Queensbridge School Birmingham at the launch of HOTBOOK, a ground breaking and free digital resource for teaching English in secondary schools, on 2nd February at the Free Word Centre, London. Nearly 350 schools have already registered to receive HOTBOOK, which has been piloted in four schools. Easter Events Friday 2nd – Monday 5th April Mischievous Peter Rabbit will be hopping along to Selfridges every day during the Easter long weekend. Peter Rabbit will be making special appearances in the Selfridges’ book department during daily story-telling performances of The Tale of Peter Rabbit at 12pm, 1.30pm, 3pm and 4.30pm. Events are free for the whole family to enjoy, however spaces are limited. Selfridges Department Store is in Oxford Street, London nearest tube Bond Street. If you work in or with primary schools how about using our Chatterbooks network of reading groups to inspire more children in their reading for pleasure? This month, building on the major success of Chatterbooks groups in public libraries, we are launching Chatterbooks into schools. The scheme supports key aspects of your school improvement plan, including attainment, SEAL, transition and creativity, as well as extended school services. It helps you offer year round book talking activities. More information and subscription details on our brand new Chatterbooks microsite at www.chatterbooks.org.uk.